Facebook, the popular social networking website, was the topic of discussion at the first Teaching and Learning with Technology Speaker Series session of 2009. Originally launched in 2004, Facebook began as a social networking website created exclusively for post-secondary students. Facebook currently has over 150 million active users worldwide, and has expanded to allow anyone with a valid email address to sign up. As it has gained in popularity, Facebook has become one of the main communication tools used by university students to stay in touch with friends, organize events, and connect with classmates. Social software tools such as weblogs and wikis are already being used for educational purposes at UBC, but can Facebook be used in an academic setting? Philip Jeffrey, an Interdisciplinary Studies graduate student, brought forth a few examples of how Facebook has been used by students and educators to quickly inform and communicate with others in the larger community. Philip found out about the potential closure of the UBC Aquatic Centre weight room through a friend on Facebook. Partly due to awareness-raising on Facebook, a grassroots movement formed that eventually over-turned the administration’s decision to close the gym. Recently, a York University anti-strike group has formed and, with over 4,500 members, the Facebook page has become a place where people go to get the latest information about the strike. Some universities are even using Facebook to recruit students. Cyprien also discovered that some students are using the site to facilitate online discussion groups. Even though students have access to WebCT Vista, and can use its discussion forum to interact with other students, some are choosing to use Facebook because it is their preferred place to communicate online. Students themselves say “well, why don’t we put it in a place where we know it’s going to work…and move it into Facebook?” Cyprien notes that “whether or not we like it…we may see more and more examples of this,” which is of concern because many Facebook users are not aware of the privacy issues related to the popular social networking tool. 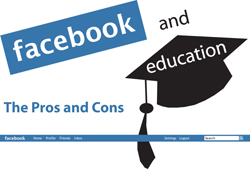 Con: Privacy Concerns – Is Facebook Right for the Classroom? Questions were raised from the audience about whether Facebook can be used in the classroom for academic purposes. The third member of the panel, Humanities and Social Sciences Librarian Sheryl Adam, raised concerns over the disclosure of personal information on the site. “Can we require that students be involved in something that requires them to put personal information on a server in the United States? I don’t think so,” asserts Sheryl. A larger discussion broke out amongst the audience, and the room came to a general understanding that if you expect students to interact with you or your Facebook group for a course, then you are requiring them to be involved in something that they may or may not know a whole lot about. For instance, users might not know that when using an application in Facebook, they are allowing the application to collect data from their Facebook profile. Philip notes that there is a “higher level of trust” amongst friends on Facebook, which may lead many to overlook the fact that if they are not careful with their privacy settings and use of applications, they might be disclosing personal information to complete strangers. You also cannot require a student to use Facebook, as not all of them will want to share their personal information with their classmates and instructor. If there is any UBC-sanctioned involvement using a tool that stores data in the United States, there has to be an option for the students to preserve their anonymity. The fact that this is not possible with Facebook (which has its servers located in the United States) raises a bigger issue: users should be concerned with how secure the service is, where the data sits, who owns the content, and how it is being used. Cyprien notes that this is not just a Facebook issue, but a general IT issue. “If you ask me how secure Facebook is, I would say not secure enough if you are worried about it,” remarks Cyprien. Some attendees said that they would like to see more centralized resources and guidance to inform students, faculty, and staff about social networking tools (like Facebook) in order to build awareness of privacy concerns and the pros and cons of their use. Attendees also thought that members of the UBC community need to be educated about these tools. Information resources, such as the Digital Tattoo Project (which Sheryl is a part of), have been created to educate students, faculty, and staff about online usage, but still more needs to be done. Cyprien suggested that we could start leveraging connections at other schools to come to a solution for a broader community. If UBC is struggling with this issue, other educational institutions must be too. It was here that Sheryl offered up the example of RefWorks, which used to be hosted on an American server. To address privacy concerns, a consortium of Canadian libraries banded together to move RefWorks data onto a Canadian server. Such a consortium could be beneficial when addressing the use of social networking tools in an educational setting, eventually helping UBC solidify a strategy for addressing issues that arise with the increased popularity of these tools. I am the chair of the Disability Resource Network (DRN) Conference Planning Committee, and am looking for conference workshop presenters. The theme of our annual conference is “ Mission Possible: Syncing New Technology with Current Practices” . I am specifically looking for a workshop on the topic of Facebook, social networking, internet safety—implications for use in the classroom—pros and cons—pitfalls, etc. This conference is geared towards post secondary educators of students with disabilities. It will be held May 30, 31, at the Vancouver Museum. I was intrigued by some of the comments you expressed on this site. Facebook is not an appropriate technology tool for the classroom. It is facile and easily abused. We have choices with our uses of technology. One can learn and lead a professional life without it. My son, for example, is a software engineer who currently leads the technology team in a private company. Neither he nor I has need of Facebook. Nor do children.